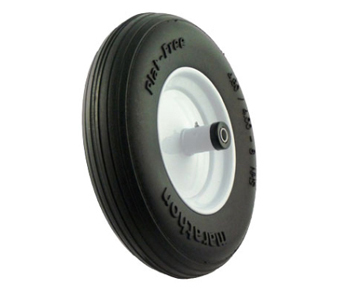 Flat-free ribbed tread wheelbarrow tire is a micro-cellular polyurethane solid tire - it's guaranteed - they rely on structure for load support. Lightweight, non-marking, oil and chemical resistant tire. This virtually indestructible tire comes pre-mounted on standard 8" rim that's equipped with ball bearing and grease fitting. Capacity: 480 lb. Weight: 8 lb. Size: 16" Dia. Axle: .5/8". Hub: 6".